Most company career sites have crappy job search capabilities (see Company Career Site Job Search is Likely Dead). And crappy job search = crappy candidate experience. Some of you have told me you sometimes can’t even find your own open reqs on your career site! But you might not know about another problem: how many job searches on your career site generate too MANY results…specifically, candidates get many “false positive” results. 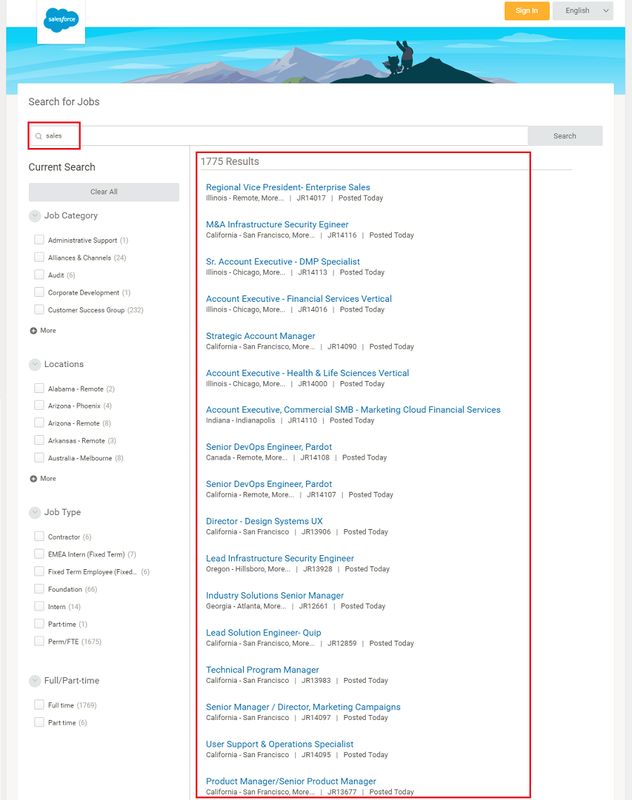 If you go to Salesforce.com’s career site (job search powered by Workday) and try searching “sales” you’ll find that every single one of Salesforce’s 1,775 jobs shows up (literally, 100% of their jobs). You can see that the #2 result (M&A Infrastructure Security Engineer) isn’t a sales job — and neither are results 8 through 17. The reason so many non-sales job results come up is that “Sales” is in Saleforce.com’s company name. It’s a “false positive”. The term false positive gets its name when a result is “false” because it’s irrelevant yet “positive” because technically the result does have a positie match (e.g. with Salesforce above the word “Sales” is certainly in each of the results. These job search false positives present a very negative candidate experience. Candidates expect a “One-Click Candidate Experience”. You’ll see in the screenshot below that 2,893 of their 2,904 total job openings come up — they don’t have 2,893 Recruiting Ops jobs. 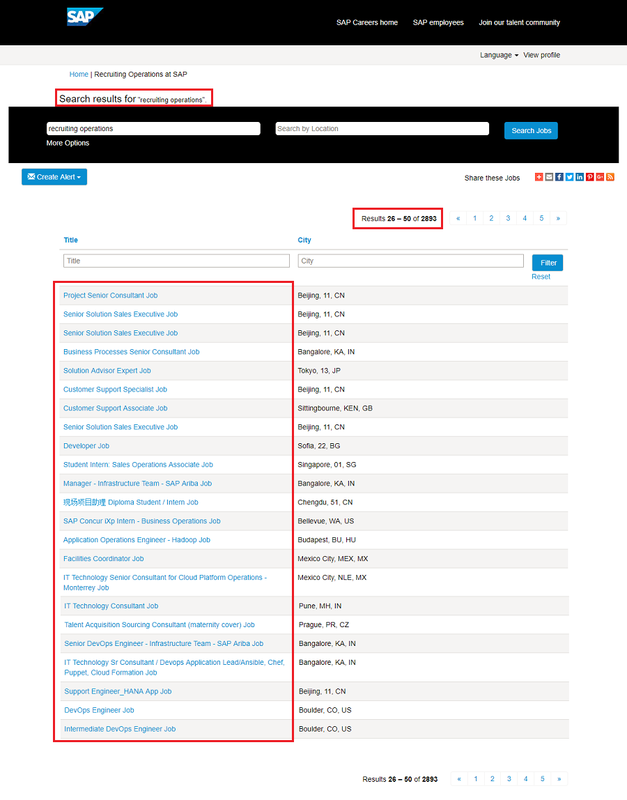 Page 1 of the search result shows 2 Recruiting Operations jobs and page 2 (which is highlighted in the screenshot below) shows zero Recruiting Ops jobs. “please send an email with your request to “Recruiting Operations Team”. So, when the candidate searches”Recruiting Operations” (or Recruiting or Operations” on SAP’s job search they get almost all of SAP’s jobs. SAP’s job search technology does not, in this case, understand that their Diversity Commitment statement is not meant to describe the job itself! A search of “Diversity” might pull up 100% of your jobs because you have a “Diversity Statement” at the bottom of every job description. A search of “Intern” might pull up any job mentioninbg “international”. A search of “HR” might pull up jobs that include the dollars per hour the candidate makes (e.g. “$18 per hr.”) instead of Human Resource jobs. I recommend that you instead move to the new breed of job search that some of us call “intuitive search” or artificial intelligence-based search. Give me a holler and I’ll show you how this new AI-powered intuitive job search can cut out false positive results and increase your career site job searches by an average of 70%+ and applications by 32%.